Happy April! I hope everyone had a good March! This past month was more chugging along as usual on the graphics update, but here’s some of the cooler stuff we’ve been up to! We showed it off a bit last month, but we’re putting in time-of-day shaders! We showed off the sunset one last month, so here’s our nighttime one! We’ve been told that it’s much more impressive in-game so we hope everyone looks forward to seeing them in action! 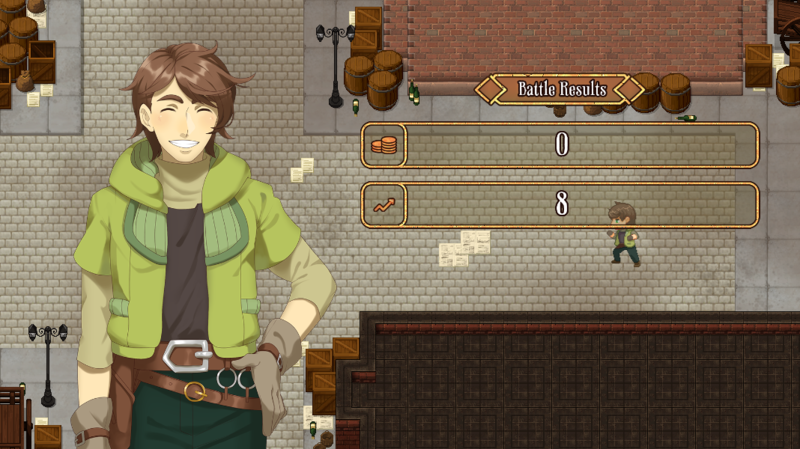 Bit of a ~spoiler~ but we’ve been making some interesting upgrades to the Debate Battle System. If you don’t want to hear any of it, best skip to the end. 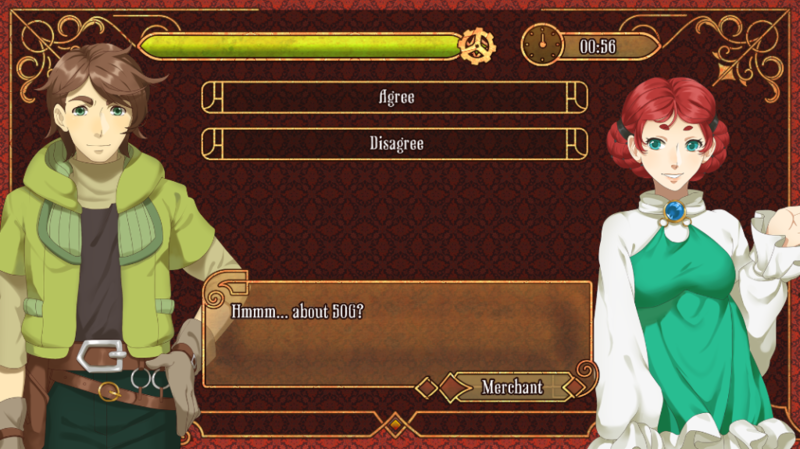 In the current demo, during the tutorial section, there is a merchant you speak to, to get some bread. In order to convince her to hand it over to you, you need to gather a set of facts from around town and use them. We’ve talked about it previously, but some of the upgrades we’ve done to the Debate Battle System is to divide gathering statements into three types: Facts, Testimonies and Evidence. 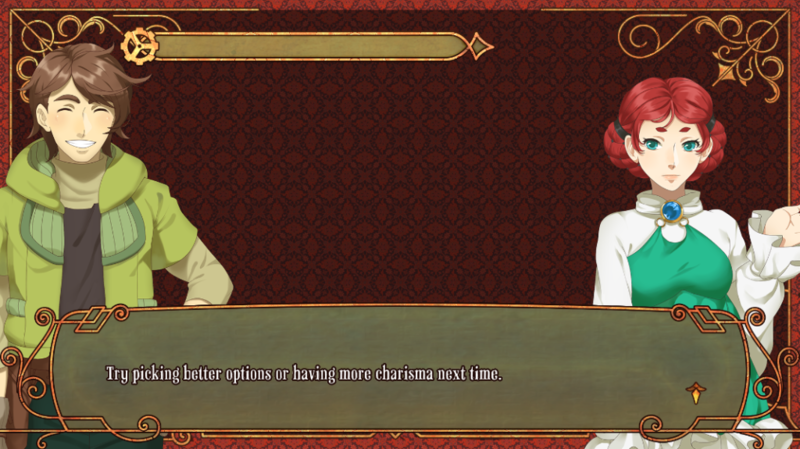 In the current version of the demo, there’s three statements and only one guy has the one you need to advance through the main story. In the new version, these three are now testimonies and gathering all three will produce a statement for you, which you can use in the debate. Cool! This means we can have less facts, but more meaningful ones. In the grand scheme of things, no one really cares that one bread seller in Vuni is not selling well, but it being a symptom of a larger problem and being used to back up a conclusion (i.e. poverty in Vuni) is much more substantive. Another minor improvement we made was to add support for custom actions during a debate. 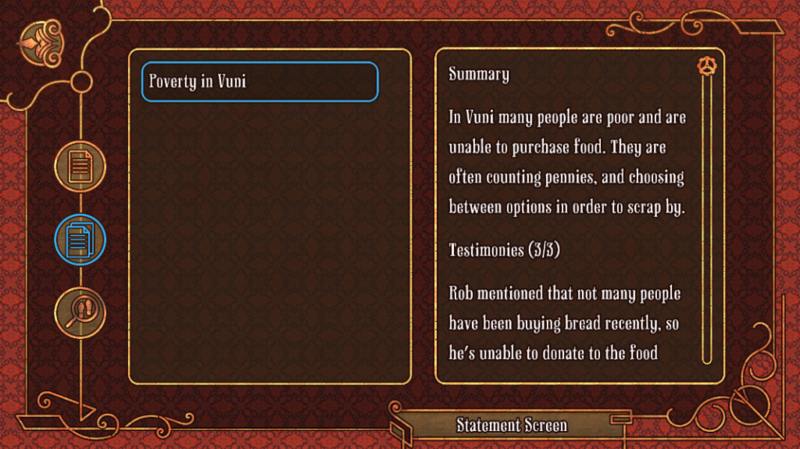 For instance, our merchant friend is a merchant, it seems obvious that she might just offer the bread to you to buy. In the old system, this wasn’t possible. To do something like this the debate would end and you could be given the option in a cutscene of sorts. Now she’ll give you the option to buy the bread instead of trading it for info. This’ll open up more possibilities for more interesting options, so we hope you look forward to it! Happy March Everyone! This past month was shorter than normal, but oddly enough very, very productive. 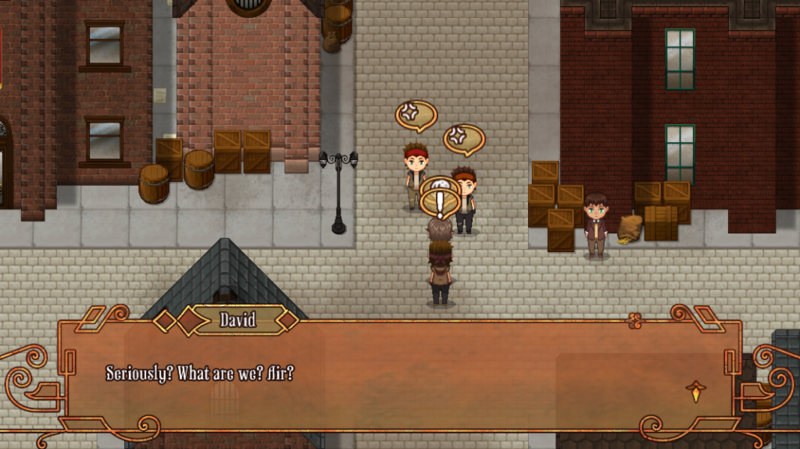 We’re moving along very well with the new graphics update and adding a bunch of polish to the game. One such example is the use of day-of-time shaders, like shown above, and also things like battle animations/transitions, more environmental/background effects during cutscenes and just general QoL improvements. One of the big things we did this past month was migrate to a new site! This has been something on our todo list for a while and was one of our 2019 goals! We hope you like it, but also if you come across any problems please let us know! One of the reasons for the new site is to post longer-form blog posts about some of the tech behind the game, maybe some creative decisions, and so on. For the moment we’ve done a quick poll with some potential ideas, so look forward to these in the next coming months! For the most part, we’re still spinning our wheels on the demo update, and will continue to do so for the next little while. This is our next big goal for the year and we are steadily approaching it thanks to the help of a couple of testers who’ve allowed us to stabilize everything much faster than expected! We’ll likely have more before and afters to show of the old demo and the new one in the next little while. In the meantime, I hope what everyone has seen so far has gotten them excited about what’s to come! This past month was mostly focused on bug fixes. We’ve started to enter into testing for the new demo, which means that we’ve been encountering a range of issues from crashes to little quality of life improvements. 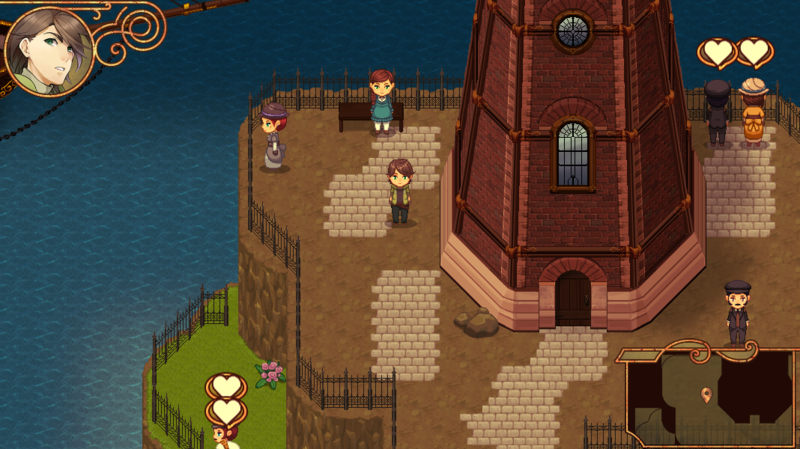 As we prep for the demo we will be mainly focused on bug fixes and these QoL improvements. This past month focused on optimization, bug fixes, updating older maps, new music, new art, and some much needed polish. Also this update is unfortunately very late due to a lack of internet. Now that we’re firmly in 2019 land, I wanted to talk a bit about 2018 and how much we actually got done! I know for a lot of people who have been following the development for a long time that it doesn’t feel like much has happened the last couple of years. As you may or may not be aware, due to family situations I had to stop all work in 2017 shortly after the Steam greenlight. 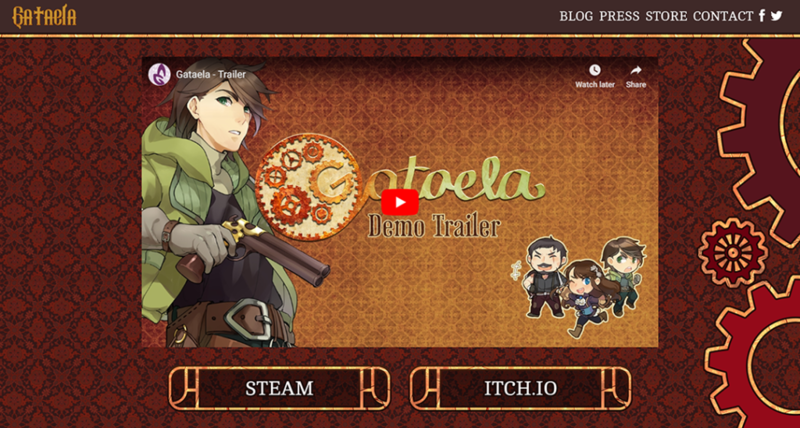 When I started up work again in 2018, I spent a lot of time thinking about the feedback from everyone from the demo, how to make the game better, and how to finish it faster. Most of this year was putting everyone’s feedback into the game. So 2018 was a really big transitional period. 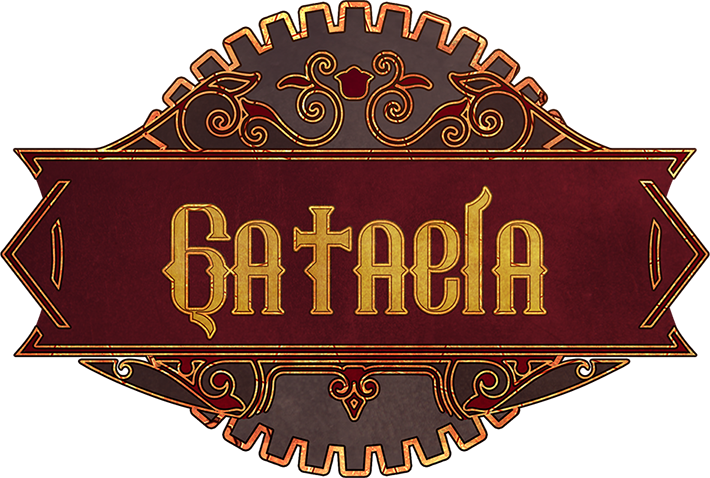 I’ve been working a full-time job since that time in 2017, so all my work on Gataela has been part-time since then, not to mention most of the Gataela team work part-time to begin with. New pixel art style for the characters! Optimized the heck out of the game, including reducing textures, switching to using shaders, optimizing shaders, etc. Converted older methods of map making to shaders, added new cool shader effects such as walking through grass, time of day, etc. RAM usage down, i.e. lower end devices can now run chrome, OBS and Gataela at the same time. So TL;DR a super busy year. New Website: We’ve been working on a new website for a little while that will give us more support for writing longer-form posts, and act more of a hub of information for the game which will be easier to search through. We really want to post more technical posts, like the shader work, how we approach the level design or some of the changes we’ve made and why, etc. Tumblr is a site focused more on micro-blogging, which makes posts, particularly with code, difficult to organize nicely. 80% Hump: We’ve been at 79% completion for a long time. Let’s get past that. New Demo: There will be a new demo published this year showing off all of the above work. It will be the same length as the older one, but with all of the improvements, and obviously the new dialogue/story segment. Beta-Testing Schedule: This year I would like to get to a point where every quarter (after the demo comes out) there is at least one new beta release to the beta testers. Other than that, we’ll see! Refactored the dialogue system to add new text effects and fix some bugs with the old one. To start with, I’d like to show off the logo again (just in case you missed it). This has been a work in progress for a while, so it’s nice to finally show it! It was designed by the lovely kathaeris. December will be a busy month. We’re planning to finish up most of the major UI and graphical updates then. We may do a stream or two during the month too, so keep an eye out on the twitter~!